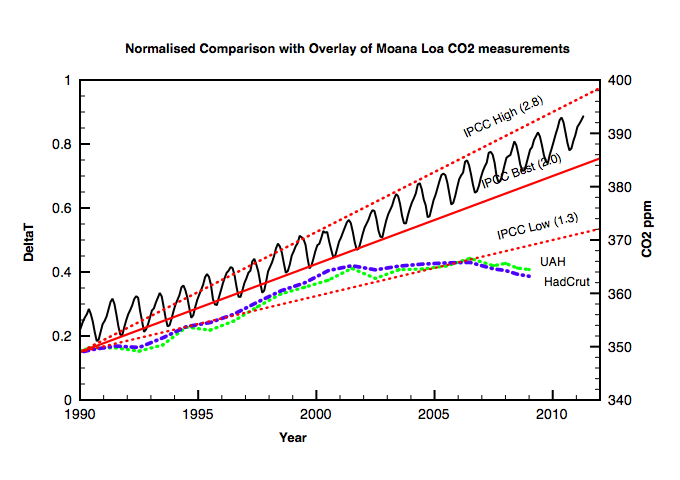 I stumbled across a site where someone decided to test the predictions made by the IPCC in 1990 and compare them to the collected temperature data. The result? So even the IPCC’s lowest result didn’t even come to pass. The period in the 2000s is particularly interesting because CO2 levels have continued to go up, but the temperature ends up loafing around, even dropping slightly. While I am NOT a believer in catastrophic global warming…it is also not correct to say that a 10 year hiatus in temperature rise negates the AGW theory. Other non-man-made influences which are cyclical in nature, may be overwhelming the “warming” caused by man. In other words, more time is needed to dis-prove the prophets of doom conclusively…but things are looking good at the moment. In terms of warming…I think the only reliable measure is ocean heat content…not surface temps…especially since that data is so corrupt in anything but the satellite record of the last 30 years.